It seemed daunting at first…monitoring temperatures, handling live cultures, and knowing just how long to incubate, but I’m pleased to say that after a little bit of practice, I can consistently turn out quart jars of delicious homemade yogurt in under a half hour (not including incubation). 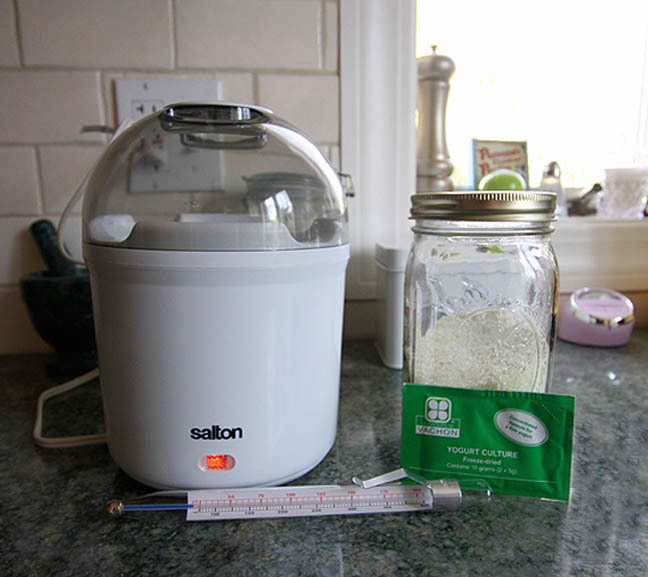 I use the Salton YM9 yogurt maker. Amazon’s price fluctuates, but I was able to pick mine up for $12.99 this past December (as I’m writing this, they’re charging $23.74, wait it out). 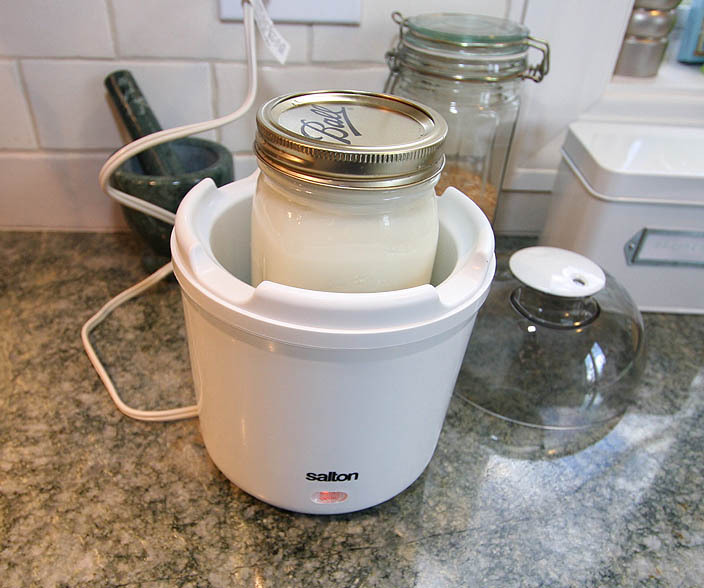 It comes with a plastic insert for incubating the yogurt, but the idea of incubating it for several hours in plastic didn’t sit well with me, so I use a 1-quart wide mouth Mason jar. I’m on my second candy thermometer, I accidently smashed my other (nicer) one on the granite counter. I thought about getting a digital one, but the old fashioned $3 mercury version works just fine. In a large saucepan, whisk together the water and milk powder. 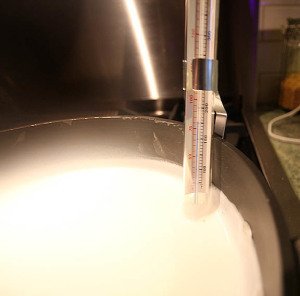 Let it sit for a few minutes to dissolve, then whisk again and heat it over medium heat to 180 degrees F.
Remove it from the stove and allow it to cool to 115 degrees F. This is very important because if it’s any hotter, it will kill your cultures. Add 1 t of dry active cultures, or 3 T of prepared yogurt with active cultures, stir it well, let it sit a minute or two, then stir it again. I generally use yogurt from my previous batch as starter, but over time the cultures weaken, so once every half dozen batches or so, I use new dry cultures. 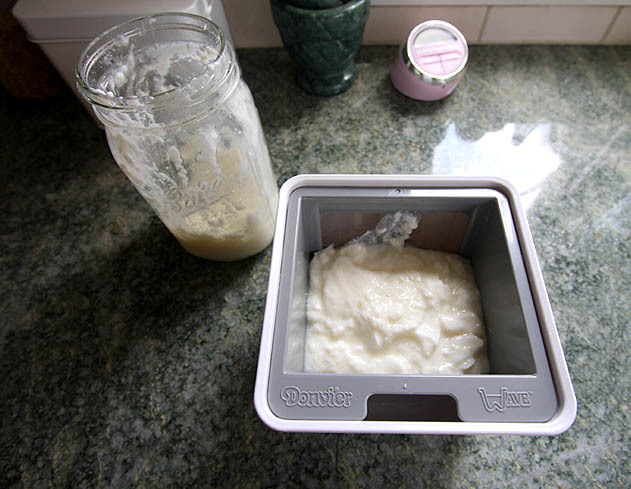 Once I’ve added the cultures, I pour it into a 1-quart wide mouth Mason jar, and set it into the yogurt maker. I incubate it covered for 5-6 hours. 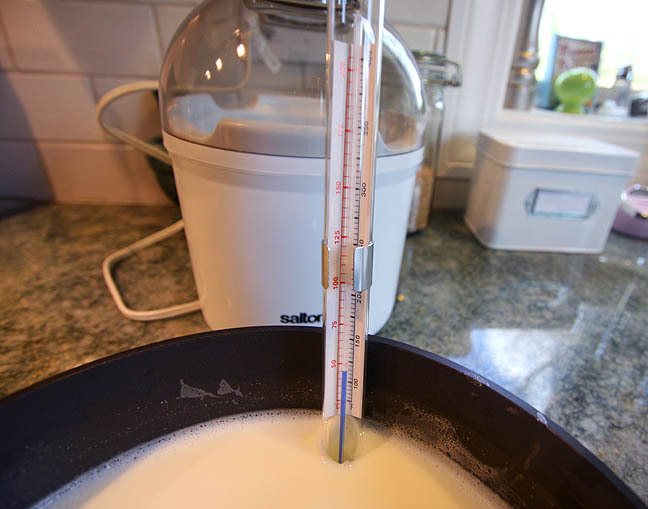 Most recipes will tell you 6-8 hours, but I prefer milder yogurt, and incubating it for longer makes it too tart for my taste. This is totally a matter of personal preference. 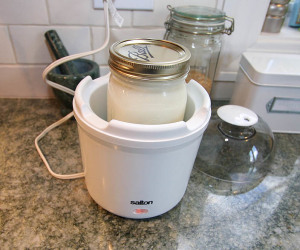 Once it’s done incubating, I strain it through my yogurt cheese maker. 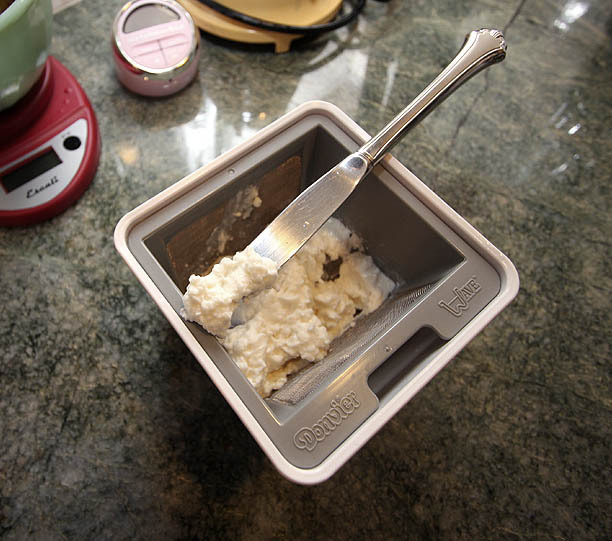 A few hours will strain off enough whey to create something similar in texture to Greek style yogurt (like Fage). This strained yogurt works great in place of sour cream and is one of my favorite ways to the cut fat out of my cooking. It’s also the perfect texture for the tzatziki sauce I love with my falafel! Straining it overnight results in something of spreadable consistency that is great on toast, bagels, etc., or in place of cream cheese in cooking. The milk powder for one batch costs about $.35, that’s way less than the price of one tiny cup of Fage yogurt from the grocery store! Of course, the price will be higher if you opt to use regular milk, but unless you’re using organic milk, I don’t see a benefit to the end product in making it that way. Disclosure: This page contains affiliate links, which means that (at no cost to you) I’ll earn a small commission for any order placed through one of the links in this post. Thank you so much Sage. When my schedule calms down a bit, this is the very next project on my list! I can’t tell you how helpful your posts are! Good thoughts to you (as always). This is going on my project list too — I eat so much yogurt that this has got to be worth the effort. I’m glad to hear the cheaper yogurt makers aren’t necessarily junk. Thanks for sharing the instructions, I really appreciate it! 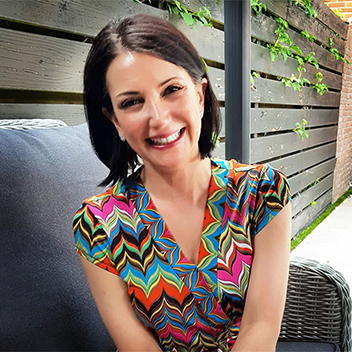 thanks for sharing-do you use the whey?